Protect your rights and maximize your payout after an Ohio car accident. We answer key questions and show you how to build a strong insurance claim. Today’s cars are equipped with high-tech safety features that reduce accidents and keep drivers and their passengers safe. But even with the latest technological advances, car accidents are a common occurrence in the US and oftentimes result in serious injury or death. If you’re involved in an Ohio car accident, you will have to deal with applicable state laws, accident reports, insurance companies, and more. Knowing what to say and do at the scene of an accident can be crucial to the outcome of any property damage or personal injury claim. To help you navigate through this tricky time, we’ve outlined a 10 step process. Following these steps will help you build a successful property damage or personal injury claim. We’ve also provided answers to some of the most frequently asked questions that often arise at an accident scene. If someone is injured and I try to help them, can I be held liable? What if I hit a parked car or other unattended property? Do I have to I report the accident to my insurance if no one was injured? Do I have to report the accident even it wasn’t my fault? The accident was my fault. The other driver said he wasn’t injured, and asked me to pay him without getting the insurance companies involved. Is this a good idea? Are there mobile apps to help file accident claims? What are my options if another driver crashes into me? 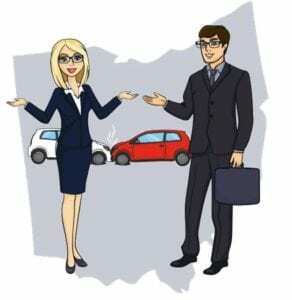 What are the minimum amounts of car insurance required for drivers in Ohio? What if I’m in an accident and the other driver was uninsured? Are police officers required to hear my version of what happened? Under what circumstances will I need an attorney? How much do injury attorneys charge? Step 9 - When Is Small Claims Court An Option? 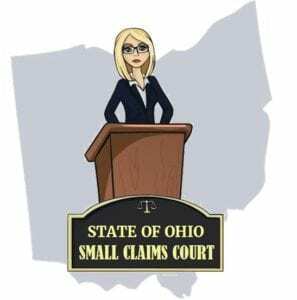 How much can I sue for in Ohio’s Small Claims Courts? Where can I learn more about small claims court procedures? What’s the Statute of Limitations for property damage and personal injury claims in Ohio? What if the insurance company won’t return my calls and the Statute of Limitations is pending? 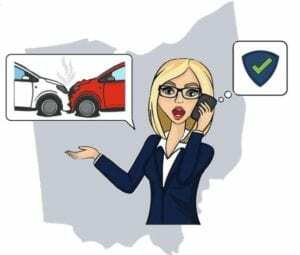 When reporting an Ohio car accident, drivers have a couple of options. If there are no apparent injuries, you can simply call 800-525-5555 (OHP) or 800-877-7PATROL to report the accident. However, if there are people involved who’ve suffered injuries, you should always call 911 immediately. Location: Try to include specific street names, highway exits, mile markers, and landmarks. Also tell the dispatcher what side of the road you’re on. Be as specific as possible with the details of your location. The more accurate your information, the quicker emergency personnel can arrive to help the injured. Injuries: Let the 911 operator know if anyone is displaying obvious signs of injuries. Also report if anyone is complaining of nausea, vomiting, pain and discomfort, or if someone is unconscious. Apparent Danger: Accident scenes are messy and dangerous. Cars are often pointed in different directions, with twisted metal and broken glass everywhere. Drivers may try to investigate the damage to their cars, while oblivious to oncoming traffic. Describing the details of the scene will help the 911 dispatcher determine which emergency personnel need to be called. Disabled Cars: Even a minor collision can result in cars being disabled. Let the dispatcher know if a tow truck will be needed to help clear the scene. Every jurisdiction has its own policies dictating when police and paramedics will be dispatched to an accident scene. Most will not send police or emergency services unless there are injuries or the accident presents a danger to others. If someone is injured and I try to help them, will I be held liable? No. While the State of Ohio does not require drivers to render aid, it’s good to know that if you do try to help the injured, you will not be held liable. If you render assistance, under Ohio’s “Good Samaritan Law” you cannot be held liable unless your helping constitutes willful or wanton misconduct. What if I collide with a parked car or other unattended property? If you’re involved in a collision with an unoccupied car, Ohio law does not require you to look for the owner. Rather, you must leave a note that includes your name, address, and the registration number of the car you were driving at the time of the collision. You must also notify the nearest law enforcement agency within 24 hours of the collision. Accident scenes evolve quickly, with flurries of activity in every direction. Before long, the cars involved will be driven or towed away, drivers and witnesses gone, and the police on their way back to the station to file their crash reports. To support you claim for damages, you will need to promptly gather as much evidence as you can of the other driver’s negligence. Evidence collected at the scene will serve as the foundation of your property damage and personal injury claim. This evidence will also protect you in the event the other driver decides to pursue their own claim against you. What other information will be helpful to my claim? Note: If the driver isn’t the owner of a car, you’ll need the owner’s name, address, phone and email. While witnesses aren’t legally required to remain at the scene, convincing them to stay will give you time to speak with them at some length to determine if what they saw could help your claim. Draw a picture of the accident scene, noting the location of the cars immediately before and after the collision, their approximate speed and the direction they were traveling. Weather and road conditions: Was it storming, snowing, or raining? Were the roads icy? Was it foggy or cloudy? Yes. Take multiple photos and videos. You can use a digital camera, cell phone, iPad or another electronic device. Photographs and videos can identify the position of the cars immediately after the collision, the weather, road obstructions, traffic lights, street signs, and other relevant information. This type of evidence can also show the demeanor of the driver, passengers and witnesses. Sound can capture admissions of fault, signs of intoxication, and other incriminating information. Witnesses do not have a legal obligation to speak with you or give you a written statement. However, if you can find one or more witnesses willing to help, ask them to write down what they saw and heard. The truth is what counts. Don’t be concerned about the legal requirements of a witness statement. Just be sure the witnesses sign and date each page of their statement. Be sure to also get contact information for each witness. Your car insurance policy is a binding legal contract between you (the insured) and your insurance company (the insurer). Most policies have what is called a “Cooperation Clause”, which identifies certain obligations for both sides. Basically if there is an accident, your insurance company will be required to provide coverage for you up to the limits of your insurance policy, including providing legal representation in the event you are sued. In return, you are obligated to cooperate with your insurance company in their investigation of the accident. This includes promptly reporting the accident to them, even if you believe you weren’t at fault. While each insurance company’s policies are different, they all basically contain the same information. Your policy states you must cooperate with your insurance company in their investigation of the accident. However, your policy does not require you to cooperate with the other driver’s insurance company in their investigation. Failing to cooperate with your insurance company may result in your policy not being renewed, a rise in your premiums, or in some cases, cancellation of your policy. Do I have to I report the accident to my insurance company if no one was injured? Violation of the Cooperation Clause: You are under a contractual duty to report the accident to your insurance company. By failing to do so, you are in violation of the terms of the policy. Delayed Symptoms: At the time of the accident, the other driver or passengers may have said they were not injured. However, because the onset of symptoms can take hours, sometimes even days to appear, they could be injured and not even know it. No Insurance: The other driver may have been uninsured or under-insured at the time of the accident and didn’t want you to know. This can be especially true if the police were summoned to the scene. Fraud: Unfortunately, there are some people who purposely involve themselves in accidents to “cash-in” by later filing fraudulent personal injury claims. Your insurance company needs time to investigate the accident so they can weed out those fraudulent claims and protect both themselves and you. Yes. By failing to notify your insurance company, you’re giving the other driver an advantage. This can be especially true when a driver leaves the scene of an accident saying they weren’t injured. Because symptoms may not appear for some time after the accident, it’s possible the other driver was injured and simply didn’t know it at the time. If that occurs, the driver may decide the accident was your fault and retain an attorney to pursue an injury claim against you. If you failed to report the accident to your insurance company immediately after it occurred, they will be caught off guard when suddenly you receive a letter from the driver’s attorney threatening to sue you. Molly was on her way to work one morning, heading north on State Road 541 toward the Cleveland Hopkins International Airport. Intending to take exit 12, Molly pulled into the right hand turn lane. She waited patiently for traffic to clear so she could safely exit the highway. As Molly was getting ready to move onto the exit ramp, Justin had entered the lane behind her. Thinking Molly was going to complete the exit, he continued to move ahead. What he didn’t realize was that Molly had slowed to let another driver pass. This caused Justin to collide with the side of Molly’s car. The two drivers pulled over to the side of the road and got out to examine the damage. Justin asked Molly if she was hurt and Molly said she was fine. Justin said he was a little shaky, but otherwise also felt uninjured. When the police arrived, Justin admitted he didn’t see Molly because he was texting his girlfriend. The police officer wrote Justin a ticket for violating Ohio’s Driving While Texting Law. Molly and Justin exchanged insurance and contact information. Because the accident appeared to be minor, with no damage to either car and no apparent injuries to either driver, they both left relieved not to be hurt and that their cars were intact. Unfortunately, Justin chose not to report the accident to his insurance company. He didn’t want his insurance company to know he received a traffic citation for texting while driving. He was afraid if he reported the accident his insurance premiums would rise. The next morning Molly could barely get out of bed. Her back was sore and she couldn’t move her neck without feeling pain and discomfort. Her husband drove her to the local hospital’s emergency room. Molly was diagnosed as having sustained a whiplash injury and disk herniation to the L4 level of her spine. She was prescribed medication for the pain and strain to her muscles, and the physician scheduled Molly for an MRI. Several days later, Molly retained a personal injury attorney. Two months later Justin opened his mail to find a letter from Molly’s attorney. It informed him that she had sustained serious injuries in the accident and that Justin was responsible for paying those bills and other related damages. By failing to promptly report the accident to his insurance company, Justin not only violated the terms of the cooperation clause, he also gave Molly’s attorney a substantial head start on the claim. By the time he received the letter from Molly’s attorney, the attorney had already located witnesses to the accident, secured copies of Molly’s medical records and bills, a medical narrative from her physician confirming her injuries were a direct result of the accident, her MRI results, and more. Justin was shaken. He wondered if his insurance company would defend him in the claim, or if he was going to be on his own. If Justin had simply complied with the terms of his automobile insurance policy by contacting his insurance company right after the accident, they would have already opened an investigation into the claim two months ago. Now Justin had to wait to see if his insurance company would cover him. Most insurance companies have two adjusters handling the same accident. One to handle the property damage aspect of the claim and the other the personal injury aspect. Be sure to obtain both claim numbers. You’ll need them for future communications with the insurance company. The accident was my fault. Neither of us was injured, and the other driver suggested I pay him without getting the insurance companies involved. Is this a good idea? No! In addition to the contractual obligations in your insurance policy, there is a very practical reason to report the accident to your insurance company promptly after the accident and not admit fault to the other driver. Some symptoms of injuries won’t appear for hours, and sometimes even days after an accident. It is entirely possible the other driver believed he wasn’t injured at the scene, but hours or even days later they begin to experience symptoms of injuries. Additionally, the driver may decide to retain an attorney. If that were to occur, and you didn’t report the accident to your insurance company, they would not have had prior knowledge of the accident, forcing them to scramble to protect you. The State of Ohio follows a 3rd Party Liability Rule. 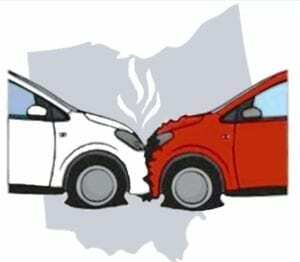 Unlike no-fault insurance states, where both parties in a car accident turn to their own insurance companies for compensation, in Ohio a victim of a car accident may pursue the at-fault driver for any property damage or personal injuries they caused. 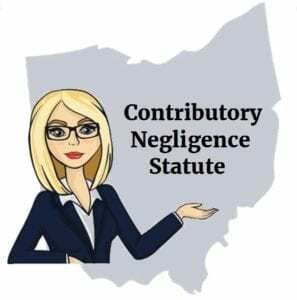 The State of Ohio follows a modified contributory negligence rule. Under this rule drivers may share liability for the same accident. When this occurs, fault is divided between the drivers. This means if you are the victim in a car accident and you had some fault in causing the accident, you are still entitled by Ohio law to receive compensation for your injuries and related damages. The amount of compensation you may receive will be paid according to the percentage of your contribution, or “comparative negligence” in the accident. However, there is a limit to the comparative negligence percentage. If the percentage of your contribution to the accident is determined to be 51% or higher, you will be legally barred from recovering any compensation from the negligent driver. Ike was driving west on Maple Street on his way to pick up his wife from work. Vera was driving in the car in front of him. Because he was running late, he was following Vera closer than he should have been. As Vera approached the traffic light it turned yellow. It appeared she was going to try making it through the intersection, but at the last second she stopped. As she did, Ike collided with the rear of her car, causing Vera to be seriously injured. Vera filed an insurance claim with Ike’s insurance company, asking for $100,000. That figure represented her medical bills, out-of-pocket expenses, lost wages, and pain and suffering. Ike’s insurance company offered her $30,000 to settle her entire claim. Vera declined the offer and sued Ike. 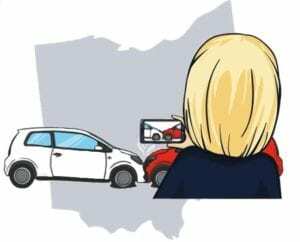 During trial, the evidence showed that Vera violated Ohio Code §4511.22 (A) by driving at an “unreasonably slow speed as to impede…traffic”. However, the evidence also showed at the time of the collision Ike was following Vera too closely, which was in violation of Ohio Code § 4511.34 (A). Under Ohio’s Modified Contributory Negligence law, the jury apportioned Vera’s percentage of negligence at 50% and Ike’s at 50%. As a result, the jury decided Ike had to pay Vera $50,000, representing the amount of her claim, minus her 50% comparative negligence. *Under Ohio’s Comparative Negligence law, if the jury had found Vera’s negligence to be at 51% or more, she would legally have been barred from recovering any compensation from Ike. To protect drivers, passengers, pedestrians and bicyclists, the State of Ohio requires drivers to carry specific minimum amounts of property damage and personal injury insurance. What if I’m in an accident and the other driver was not insured? If you’re in a car accident with an uninsured driver, you have the option of reporting the driver to the Ohio Bureau of Motor Vehicles. By doing so, the uninsured’s drivers license may be suspended until you are fully compensated for the property damage or personal injuries you sustained as a result of the driver’s negligence. For the reporting instructions and Crash Report form required, go to the Ohio Bureau of Motor Vehicles. Local law enforcement officers are trained in accident scene investigation. You are required to obey their lawful direction and cooperate in their investigation of the accident. You can try speaking with the investigating officer to give your opinion of the events leading up to the collision. However, the officer has no legal obligation to discuss the accident with you. While the investigating officer is on the scene, s/he will likely want to speak with everyone involved. Just be patient and follow the officer’s directions at all times. However, if you are being questioned by the police about driving under the influence, possession of drugs, or for any other action which might result in criminal charges or your arrest, you have the right not to answer. If the police officer decides you violated one or more of Ohio’s traffic laws, you may be issued a traffic citation. You can try to talk the officer out of it, but once s/he issues the citation, you must accept it and if requested, sign it. Remember, signing a traffic citation is not an admission of guilt, nor is it admissible in court as conclusive evidence of fault. Rather, your signature is simply an agreement you will appear in front of a judge to face the charge. At that time, you may enter a plea of not guilty and contest the citation. You can also attempt to negotiate a “plea bargain” with the prosecutor. In return for paying a fine and attending a driver education course, the citation may be dismissed and not appear on your driving record. Many personal injury claims can be handled without legal representation. Others always require the assistance of an experienced personal injury attorney. If your only losses were damage to your car or personal property, you will probably not need an attorney. You can easily deal with the at-fault driver’s insurance company through their claims adjuster. Additionally, if your injuries were relatively minor “Soft Tissue” injuries, you can likely handle your own personal injury claim. Soft tissue injury claims can include sprains and strains to muscles, tendons or ligaments, minor contusions and abrasions, and similarly minor injuries. These claims are normally straightforward and include a minimal amount of medical bills, expenses, lost wages, and pain and suffering. Minor injury claims without question of fault are normally settled within a short time, and rarely result in lawsuits. Because settlements in soft tissue injuries are normally modest, it may be difficult to find an attorney to represent you. This is because the settlement may not be enough to fairly compensate you after attorney’s fees are deducted. If your injuries are serious, often referred to as “hard injuries”, you will need skilled legal representation. Hard injuries can include permanent disfigurement or disability, 3rd degree burns, fractures, disk herniations, traumatic brain injury, and the like. Don’t be fooled. When representing yourself in a serious injury claim, the adjuster may lead you to believe you are a great negotiator and may even appear empathetic. But without an attorney, you are at the mercy of the insurance company. Serious injury claims often require hiring medical experts, independent testing, accident reconstruction, depositions, interrogatories, requests for production, and other legal procedures only an experienced attorney can provide. Injury attorneys rarely charge for an initial office consultation. It’s in the best interest of an attorney to listen to what you have to say about the accident, while reviewing your medical records, crash report, witness statements, and other relevant information. Once an attorney reviews your case, s/he will likely be able to tell you the strength of your claim, the probability of a settlement, the approximate time it may take to resolve the case, whether or not a lawsuit will need to be filed, and the general amount you can expect to receive. If an attorney accepts your case, it will likely be on a contingency fee basis. This means the attorney will not charge any legal fees or costs for preparation of the case until the case is settled or won in court. At that time, you’ll have to pay the attorney anywhere from 25% – 40% of the gross settlement. Step 9 – When Is Small Claims Court An Option? There are times when filing a lawsuit against a driver may be your only option. When this occurs you can consider suing the driver in one of Ohio’s Small Claims Courts. 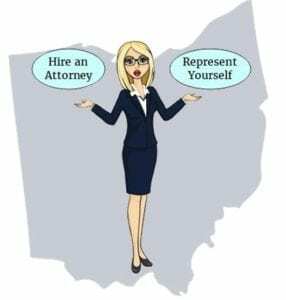 When would I consider filing a lawsuit in one of Ohio’s Small Claims Courts? Ohio Small Claims Courts have jurisdiction to hear cases up to $3,000. If you decide to file a lawsuit in small claims court, you must sue the driver who caused the accident and not the driver’s insurance company. The insurance company did not cause the accident. They are an entirely separate entity which provided insurance to the driver who crashed into you. To learn more about filing a small claims lawsuit, read this guide from the Ohio Judicial Conference. 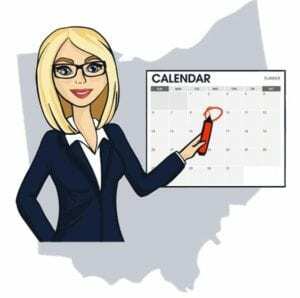 The State of Ohio has a statutory time period, called the Statute of Limitations, within which car accident victims have to settle their personal injury and property damage claims or file a lawsuit. To preserve your legal right to pursue the at-fault driver for compensation, you must settle your claim or file a lawsuit within this time period. If you fail to do so within the statutory period, you lose your legal right to pursue the other driver for compensation. What is the Statute of Limitations for property damage and personal injury claims in Ohio? With some exceptions, the statute of limitations period starts on the day of the accident. For personal injury claims in the State of Ohio, the limitations period is 2 years. What do I do if the insurance company won’t return my calls and the Statute of Limitations is pending? The claims adjuster handling your claim is under no legal obligation to settle within the statute of limitations period. The adjuster also does not have to remind you of the expiration date. The claims adjuster is not your friend, no matter how empathetic they may appear. Be sure to enter the statute of limitations expiration date in your calendar, your computer, your cell phone, and any other places where you will be reminded. Give yourself plenty of reminders and be vigilant. Remember, once that date has passed, you are out of luck and can never again pursue a claim against the other driver. I was in a car accident recently. I was driven the to ER afterward by a loved one. While there, I was diagnosed with whiplash….